Adventure Game Studio | Games | AGS Chess! 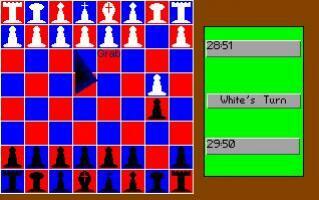 This is my version of chess made with AGS! It has proper peice movement, castling, etc. (No en passant, sorry). It is two player, and has an turn-based clock starting at 30 minutes per player. It has a few bugs, and cannot properly detect checkmate/stalemates, but that's stuff you can do yourself right? Please enjoy and comment/vote!!! "Has potential but isn't really playable in the current state. You can keep moving the same color without changing turns, checkmate isn't recognized and there are other problems." If you will work on it more, it can be better.